Marilyn Monroe received her first Golden Globe in a ceremony at the Club Del Mar, Santa Monica California, in 1952, when she was 25 years old. More accurately it was the Henrietta award, an almost two foot tall statuette of a woman, but named after a man, Henry Gris, one of the first presidents of the Foreign Press Association of Hollywood, a predecessor of the HFPA. At the time the Henrietta, was given to the actor and actress deemed "best young box office personality" according to a survey of the viewing and reading public of members' home countries, and Monroe won the 1951 poll, the year before she had her first leading role, in the noirish Don't Bother To Knock. All told the HFPA honored her four times: Three times for her popularity and once for her performance as the Lead Actress in a Comedy, for Some Like It Hot, in 1959. Her last win came in 1962, a few months before her death at age 36. That recognition turned out to be very important to Monroe, as Dr. Susan Doll wrote in an article....”Marilyn's February 1962 purchase of her new home and her winning of the Golden Globe Award as World's Film Favorite in March, would be the last two high points of her life." 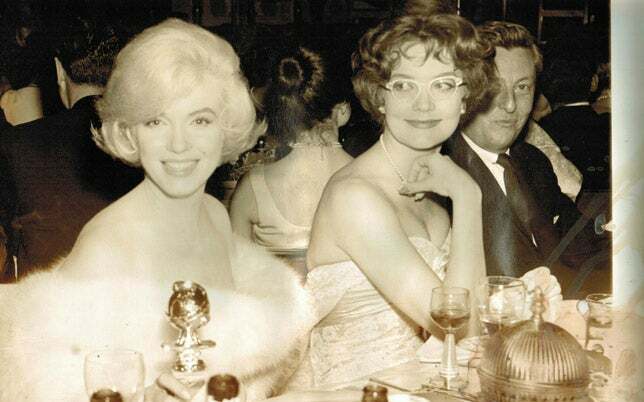 The Golden Globe for Some Like it Hot (she was also nominated for a Golden Globe for best actress, Drama in 1956, for Bus Stop) would be Monroe's only American acting award. She won several awards from magazines (Look, Redbook, Photoplay), and several European film awards, but she never received as much as a nomination from the Academy. Only the HFPA recognized and awarded Monroe for her acting, and only the HFPA gave Some Like it Hot the recognition it so richly deserved. Documentation of Golden Globes from the early years is hard to come by, and the HFPA is always on the lookout for material missing from its archives. Theo Kingma, the current president and a noted Dutch photographer as well as photo collector, was searching EBay recently when he happened to come across a rare original photo for sale: a black and white original print showing Marilyn Monroe at the 1952 Golden Globes awards, seated at a table with her statuette, as her table mate looks on. “Not only did we not have any original print of a photo from that event" he said," but the way the other woman is looking at Monroe gives this photo a special poignancy". The original print, a bit yellowed at the edges but in good condition for its age, some 62 years, was offered for sale by a West Hollywood memorabilia shop, Sweet Baby Jane. The store's owner, Roy Windham, a Los Angeles native, is a long time collector, who turned his hobby into his business after a decade in banking. He used to go looking for material, in the USA and in Europe, but now he relies on 'pickers', he said, people who go to estate liquidations, garage sales and flea markets looking for items they can then sell to specialty shops like his. "Los Angeles is naturally the best place on earth for finding movie memorabilia" he said. "Movie industry veterans pass on, and their possessions are often sold or given away". He delights in telling about treasures found: A script of Gone With the Wind signed by the whole cast, for example. The picker who paid 25 cents for it sold it at auction for five figures, he said, and was able to start her own business with the money. Or the framed, autographed photo of Joan Crawford that he picked at an estate sale for a few dollars. When opening the frame later to clean the glass, he found that there were five other original photos stored inside, all autographed, going back through the decades to an original George Hurrell from the 1930s. The original photo of Marilyn Monroe and her 1952 Globe is now back in the HFPA archives. It is not signed and has no stamps or markings on the back, so the photographer is unknown. Explained Scott Forter, a leading expert and collector of all things Marilyn: "At that time, the Globes was a smaller, more open affair, with no official photographer, no tight security, and a large group of press photographers moved freely among the tables with their Speed Graphics and large flash guns, as you can see in a reverse angle photo taken at the same time." Scott couldn't identify the woman seated to Monroe's side, simply saying, wistfully, "how lucky she was".. If you can identify her, write the HFPA, and you'll get a reward: A print taken off our new archive print.